Walmart is testing a new dress code that allows employees to wear blue denim and shirts of any solid color. Employees were previously banned from wearing blue denim, and shirt colors were restricted to blue and white. "I personally love the new dress code — especially that we can wear any color," Angel Hernandez, an employee of a Walmart store in Springdale, Arkansas, told Business Insider. The company faced backlash four years ago when it enforced a new dress code. It later relaxed those restrictions. Walmart is testing a new employee dress code in some stores to give workers more freedom over their clothing choices. The updated clothing guidelines, which were implemented in several stores last week, allow employees to wear blue "jeggings" and blue jeans — which were previously forbidden for most Walmart workers — and shirts of any solid color, according to a Walmart manual reviewed by Business Insider. Until last week, solid white and solid blue were the only acceptable shirt colors in Walmart's dress code. Even though Walmart has a reputation as a low-paying and demanding employer, there are some jobs that pay very well and report high employee satisfaction — especially if you're in management. Check out incredibly important work skills that money can't buy you. Store manager is one of the best jobs you can land at Walmart, according to Joni Holderman, a professional resume writer and founder of Thrive! Resumes. "Few people realize that Walmart store managers can earn $150,000 to $250,000 per year in salary and bonus — if their store achieves all its performance targets," she said. A former Walmart store manager who worked for the company for more than eight years wrote in a review on Glassdoor that Walmart has a "great compensation package," and gives you "a chance to work with a diverse group of associates and customers." Although employee satisfaction rates are high and the pay is great, this job does not come without its stressors. Store managers run the show: supervising all employees, meeting financial goals, enforcing regulations — which includes firing people — delegating work, tracking inventory, analyzing sales data, processing payroll and coordinating merchandise shipments. It's a big job, but it comes with a big paycheck. Walmart assistant managers average $47,538 a year, which is right on target for the national average salary, according to Glassdoor salary data. If you factor in bonuses and additional compensation, the average pay increases to $58,583 a year. Assistant managers must have at least two years of college experience, or one year of retail and one year of supervisory experience. Job duties include meeting store sales and financial performance goals, ensuring compliance with procedures, managing and supervising associates and enforcing customer service guidelines. Although this might seem like a lot of responsibility for an assistant role, it's an excellent opportunity to gain experience and move up your career ladder. One former assistant manager in Amarillo, Texas, wrote in a review on Glassdoor that Walmart is a "great place to learn a skill and grow your resume, or grow with the company." Shift managers at Walmart make an average base salary of just over $65,000, according to Glassdoor. The total compensation jumps to an average of more than $78,000 after factoring in the $19,528 cash bonus, $3,471 stock bonus and other financial rewards. A shift manager in Las Vegas, Nev., wrote on Glassdoor that the "salary for management is great," and a former shift manager in Big Spring, Texas, wrote that Walmart is a "good company for beginners," they "work with your schedule" and "teach you the basics." Shift managers have complained on Glassdoor about long days, difficult work-life balance and heavy workload associated with this job, but this job topped the list because there are great advancement opportunities for those who might not have a degree, and the pay is well above average. The typical pharmacy manager at Walmart makes about $142,000 a year, according to Glassdoor data. When bonuses, like an average annual cash bonus of nearly $22,000, are factored in, pharmacy managers make closer to $160,000 a year. Pharmacy managers are responsible for driving sales and increasing profit in Walmart pharmacies and over-the-counter areas. They must ensure confidentiality of customer information and assigned records, model and enforce the company's customer service guidelines and oversee and implement community outreach programs. This job isn't just for anyone off the street, either — Walmart pharmacy mangers must hold a Bachelor of Science in Pharmacy or PharmD and carry a pharmacy license. A pharmacy manager in Albuquerque, N.M., wrote on Glassdoor, "I like this job better than any other retail I've been at." Other current and former employees said they sometimes face stressful and busy environments, long hours and demanding workloads. Still, this job is one of the best at Walmart because of its stability, good benefits, room for career advancement and excellent compensation. Order fillers at Walmart make an average of about $38,000 a year with an average base pay of $18 an hour, according to Glassdoor. There's also additional annual compensation, like a $2,798 average cash bonus, $1,267 stock bonus, $1,141 profit-sharing and $220 commission-sharing. Order fillers work out of Walmart distribution centers and are responsible for moving merchandise onto the company's fleet of delivery trucks and keeping the warehouse organized. This can involve working off-hours and operating machinery in a fast-paced environment. An order filler from Buckeye, Ariz., said on Glassdoor "everything about this job is good" and that Walmart is a "great place to start a career." Order fillers are 21 percent happier than other Walmart employees, according to job search and review website Career Bliss. A former order filler from Brundidge, Ala., reported to Indeed that the pay and benefits were good, but the job had "long hours." Despite the hours, this position made the list of top jobs at Walmart because it's a relatively high-paying entry-level position that doesn't require interacting with disgruntled customers or managing employees. These five Walmart jobs made the list of the worst due to the largest pay gaps compared to management, high levels of stress and little room for career advancement. Click through to find out which Walmart jobs are the worst. 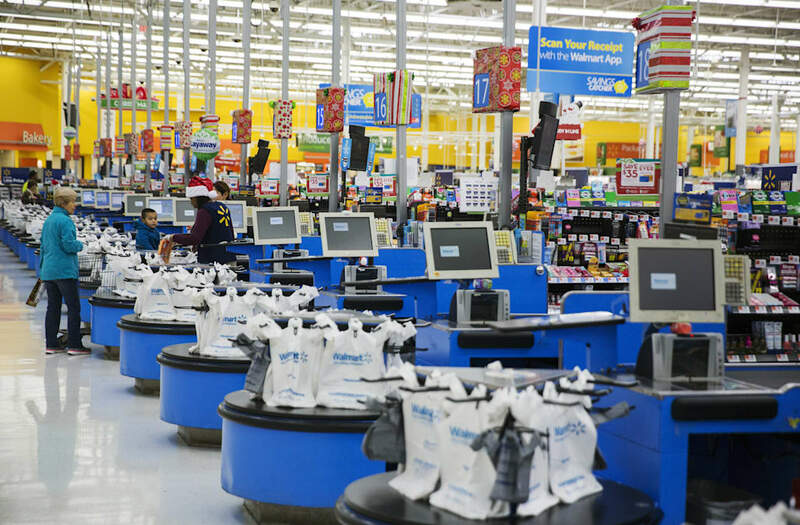 Cashiers at Walmart are responsible for scanning, bagging and loading merchandise at the checkout. Walmart cashier hourly wages range from $7 to $15, with the average falling at $9 an hour — making it one of the lowest-paying jobs at the company. As one former employee on Glassdoor put it, the pay is "not bad out of high school, but hardly enough to live past that." Employees also say the job entails a lot of stress, is very physically demanding and is subject to hours getting cut during slow seasons, according to reviews on Glassdoor. Cashiers also must achieve the "Item Per Hour" and "Scanning" percentage goal, which can contribute to the demands and stress associated with this role. One Glassdoor reviewer listed out his least favorite parts of the job, including "Hard to work for low pay, hours can be horrible especially for cashiers, late nights and early mornings…" Cashiers at Walmart also face monotonous tasks, long lines of customers and, as one former Walmart cashier in Junction City, Kan., wrote, "The customers are not always the happiest of people." Inventory control specialists at Walmart work mostly in the back room of the store. They are responsible for all inventory that comes in and out, as well as transporting merchandise to the sales floor using forklifts or pallet jacks. Based on 106 Glassdoor salary reports from Walmart employees, the typical inventory control specialist hourly rate is $10. When factoring in bonuses and additional compensation, the pay only increases to $20,259 a year. Inventory control specialists are 34 percent less happy than other employees at Walmart, according to Career Bliss. Employees in this role report they feel understaffed and overworked, and that work-life balance is "severely skewed," according to Glassdoor reviews. The hours can be long and late, and one former employee said on Glassdoor that they kept the team "stocking past 1 a.m. because they didn't have enough people that night." In addition to meeting Walmart customers at the store's entrance, greeters also assist customers in getting shopping carts, providing store directions or other customer service duties. That might seem easy, but it's important to note that greeters are also responsible for identifying potential security threats, or shoplifters, and cleaning floors and restrooms. "Greeter may be one of the worst jobs at Walmart, when you realize that they are really security guards," said Holderman. "Studies show there is less shrinkage — meaning shoplifting — at retail stores where customers are greeted at the door." In addition to the risky environment and stressful job responsibilities, the pay for Walmart greeters ranges from just $7 to $11 an hour, the lowest salary range on this list. One current employee also said on Glassdoor there's "no room for advancement if you can't stand on your feet for an entire 8 hour shift" and that raises are only 40 to 50 cents a year. Based off more than 1,500 employee reviews, Glassdoor reported that Walmart's current sales associates earn just $9 an hour, which equates to about $18,720 a year. Not only is the pay low, but sales associates also have some unpleasant job responsibilities, including cleaning all areas of the store, performing routine maintenance on machines and other equipment, retrieving abandoned store carts, bagging customer purchases and stocking merchandise. One sales associate in Elkton, Md., said on Glassdoor the atmosphere is "friendly," but chances of promotion are "slim." Another sales associate in Clinton Township, Mich., does not like "dealing with rude customers and rude people." Given the low pay, few opportunities for advancement and unsavory job duties, this job ranks as one of the worst on this list. This is the one management role that made the list of worst jobs at Walmart. In addition to making just $24,094 a year, Walmart's customer service managers are required to fulfill a wide range of duties and hold a lot of responsibility. A customer service manager spends a great deal of time enforcing proper operations in the store, according to its job description. This includes getting change for cashiers, preparing cash registers and auditing registers for shortages. They must also handle customer complaints and concerns, as well as training employees. Glassdoor reviewers who worked as customer service managers said they were overworked, understaffed and underpaid. A current customer service manager in Port Orange, Fla., wrote, "Hours are cut to the bone constantly and the store is chronically under-staffed, even during holidays and peak sales hours." He said if the test goes well, then the new dress code will be rolled out to every Walmart store. Walmart spokesman Kory Lundberg said in an emailed statement that the company "won't know next steps on this test until we’ve had a chance to learn what works and what could work better." Bloomberg's Matthew Boyle first reported on the dress code changes. Walmart employees have been asking for a more flexible dress code for years. The company faced backlash four years ago when it enforced a new dress code requiring white or navy collared shirts with khaki or black pants, close-toed shoes, and an updated royal blue Wal-Mart-branded vest. Walmart later loosened the requirements to allow employees to wear black or khaki-colored denim, as well as enable those working in the back of the store and doing more physical labor — like unloading trucks — to wear blue jeans. According to the Walmart manual, the dress code bans the following items: leggings, yoga pants, windsuits, sweatpants, scrubs, spandex pants, overalls, or overly long pant legs that drag on the floor. Leather, prints, distressed materials, patches, white stitching, and bedazzled clothing are also all prohibited. Facial tattoos are not permitted, but tattoos elsewhere on the body are allowed as long as they don't contain obscene, racist, sexual, or other offensive words or imagery. Overall, the company requires that employees' clothing fits properly and is free from holes, fraying, and stains. "Good personal hygiene is expected when you report for work," the manual says. "Your hair must be clean and well groomed. Beards and mustaches must be neat and trimmed."